Whether you believe you have Succession Planning under control or that your Succession Planning is on life support, the following Succession Planning Checklist is a quick measure of the maturity level of your Succession Planning and what areas need to be improved. 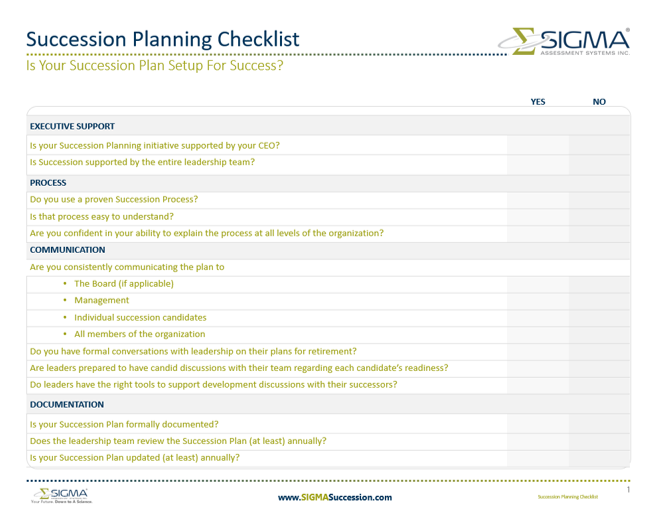 Is your Succession Planning initiative supported by your CEO? Is Succession supported by the entire leadership team? Do you use a proven Succession Process? Is that process easy to understand? Are you confident in your ability to explain the process at all levels of the organization? all members of the organization? Do you have formal conversations with leadership on their plans for retirement? Are leaders prepared to have candid discussions with their team regarding each candidate’s readiness? Do leaders have the right tools to support development discussions with their successors? Is your Succession Plan formally documented? Does the leadership team review the Succession Planning document (at least) annually? Is your Succession Planning document updated (at least) annually? Detailed Success Profiles for each leadership role? Populated Succession Benches for each leadership profile? Successor Profiles for each Succession Candidate? Development Plans for each Succession Candidate? Documented metrics to gauge the success of your plan? Does your plan include detailed timelines and deliverables? Do you have a process in place to hold participants accountable? Do you have a scheduled annual review that includes your entire leadership team? Is the Succession Plan aligned with the organization’s long-term Strategic Plan? Is there a plan in place for multiple levels of the organization (i.e. not just the CEO)? Are recruitment, hiring, and talent development aligned with your Succession Plan? Have the Success Profiles been built with the future in mind? Are you focused on developing pools of talent for each role vs. identifying one successor? Regardless of your score above, our Succession Planning Launch Series can help. With just two separate half-day workshops, the Succession Planning Launch Series delivers a comprehensive full-year implementation plan customized for each member of your executive team. Find out more here.